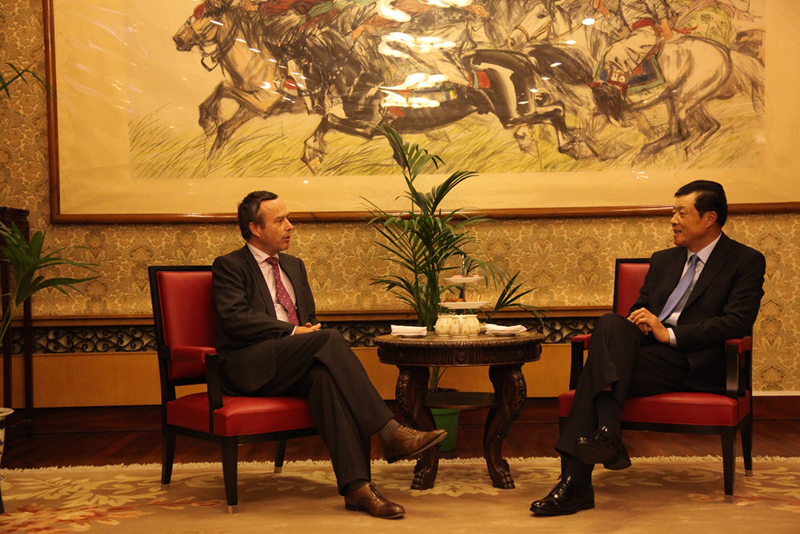 On 9 October, Ambassador Liu Xiaoming met with Financial Times editor Lionel Barber at the Embassy. He briefed Mr. Barber on the latest development of China-UK relations, with specially emphasis on the significance of President Xi Jinping's state visit to the UK. James Kynge, Emerging Markets Editor of Financial Times, and Minister Counsellor Zhang Yangwu, Spokesman of the Embassy were present at the meeting. Ambassador Liu talked about an increasingly mature relationship between China and the UK, referring to it as entering its best time in history since the two countries established diplomatic relations. High-level exchanges between the two sides remained frequent and close. Bilateral cooperation in various areas has made remarkable progress and enjoys broad prospects. In this context, President Xi Jinping, at the invitation of Her Majesty The Queen, will pay a state visit to the UK. This will be the first state visit by the Chinese president in ten years. It is expected to mark a new milestone and herald a 'golden era' in China-UK relationship. He hoped that the Financial Times, as a leading, mainstream newspaper, will cover the state visit, its outcomes and its significance actively and comprehensively. Lionel Barber expressed his thanks to Ambassador Liu for the briefing and said that the Financial Times attached great importance to and was earnestly looking forward to President Xi Jinping's state visit to the UK. The FT will follow the visit closely and give a comprehensive and in-depth report in order to help readers in Britain and around the world have a better understanding of the progress in China-UK relations and the broad prospects of this relationship in the "golden era". Barber wished President Xi's visit a complete success. During the meeting, Ambassador Liu also answered questions from his guests on China-EU relations, China-UK trade, economic cooperation and cultural exchanges, the internationalization of RMB and China-US relations.